Join us for our final show of the year. As we walk along the quayside performers will emerge from the nooks and crannies to sing songs and spin yarns surrounded by the beautiful setting of Victoria Quays. A real one off ‘not to be missed’ experience. Our venue for the night is The Dorothy Pax who will be hosting a Winter Fair where you will be able to get have a few refreshments, play games, sing songs and get warm by the outside fire pits. Merriment will continue at The Dorothy Pax after until late. 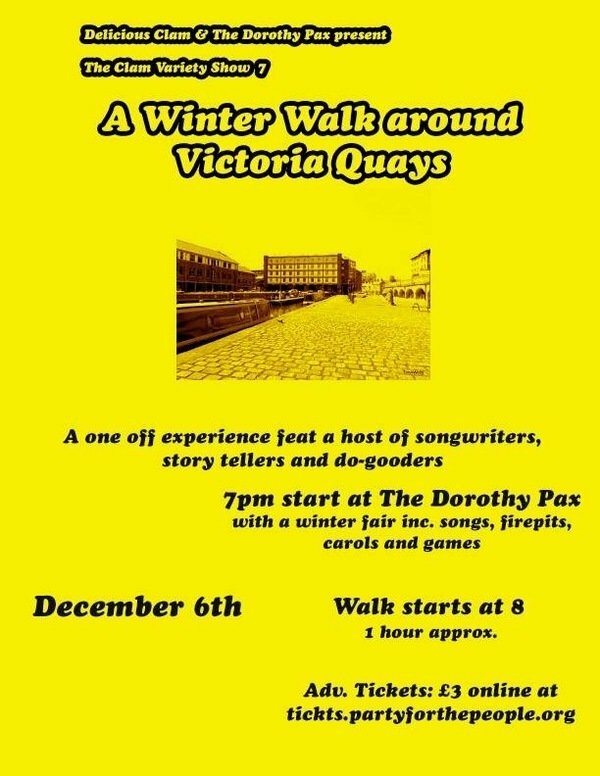 Tickets for the walk* are £3 (+£1.10 booking fee) at this link https://tickets.partyforthepeople.org/events/4402-clam-variety-show-7-a-winter-walk. Any profits made from the night will be going to Roundabout. *To be clear, the ticket is just for the walk part and not the parts before and after at The Dorothy Pax. Saying that, because we will be fundraising on the night for Roundabout there will be a bucket and it would be amazing if you could pop a few quid on it.